I was approached a while back by the lovely admin team of Pedi-Sox. I had seen these before but only on other blogs. So when they asked if I'd like to review some and host a giveaway I jumped at the chance. But first a wee bit of info on them. Pedi-Sox are a unique one-of-a-kind toeless pedicure sock. They are an additional step in the pedicure process adding value to the professional or home service while providing solutions to everyday pedicure dilemmas - i.e. dry skin, cold feet, hygiene. Just slip-on Pedi-Sox at the end of the pedicure process, right before the toenails are painted. Clients can either walk out the door in the sox alone or slip into sandals. It's that easy! 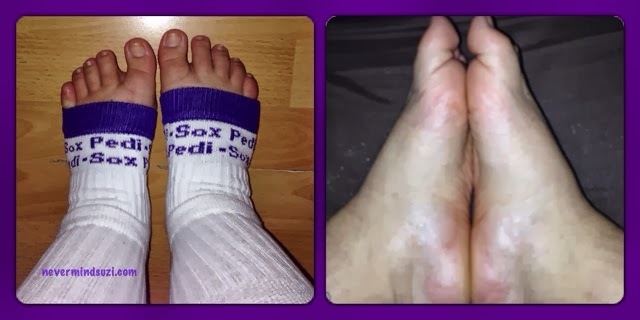 What are the benefits of using Pedi-Sox? Promote Wintertime Pedicures... pedicure is cyclical, encourages year-round services. Feet Stay Comfy... those tile floors can be so cold in the winter. Sox Aide Moisturiser Absorption... for softer smoother feet. Feet Stay Clean... as freshly pedicures feet are magnets to dust and small hair clippings. Callus Elimination... Pedi-Sox help soften and fade calluses. Repair Heels... Pedi-Sox are essential to repair dry cracked skin & heels. Lock in Benefits... of healing serums, creams and treatments. Toenails Dry Flawless... you can walk out the door in Pedi-Sox. Protect from UV... using gels? 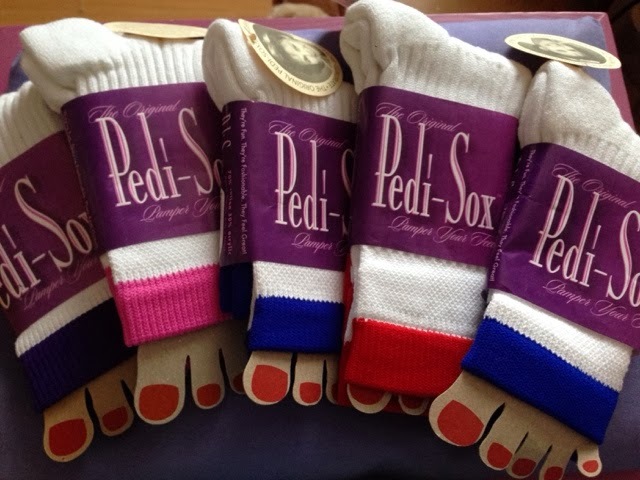 Pedi-Sox shield sensitive skin. Luxuriate... sox extend the pleasure of the pedicure experience! Simply... skin will look and feel healthier! I decided to try my Pedi-Sox when I came out of the shower. So I went through my "good" feet routine (basically good means I'm actually taking the time and paying some attention to them). So fresh out of the shower I grabbed my Micro Pedi and gave my heels a quick buff (please note I'm lucky to have fairly low maintenance feet). Popped on the foot cream of my choice, tonight it was Soap & Glory - Heel Genius and I topped off with my Pedi-Sox. Now I admit I had no intention of painting my toe nails which is the main advantage of these fab socks, but for me it meant the ability to wear my flip flops round the house but without the risk of breaking my neck (I usually do the above steps minus the Pedi-Sox and foot cream and flip flops are not a good safe combo). And I've got to say they are genius! Firstly there was so slip slopping about like there usually is. Secondly it gave the foot cream time to do its magic. And thirdly as my toes weren't covered I was able to wear them in bed (don't ask it's a "thing" of mine). So overall I've got to give Pedi-Sox a 5***** review. In brief a pair of good quality socks that keep your feet warm, allow you to paint those little piggies and help any lotions or potions get to work. I've got ... Pairs of these to giveaway so just check out the rafflecopter widget below and GOOD LUCK!! Nice, I really REALLY fancy a pair (or six) of these, they look awesome!